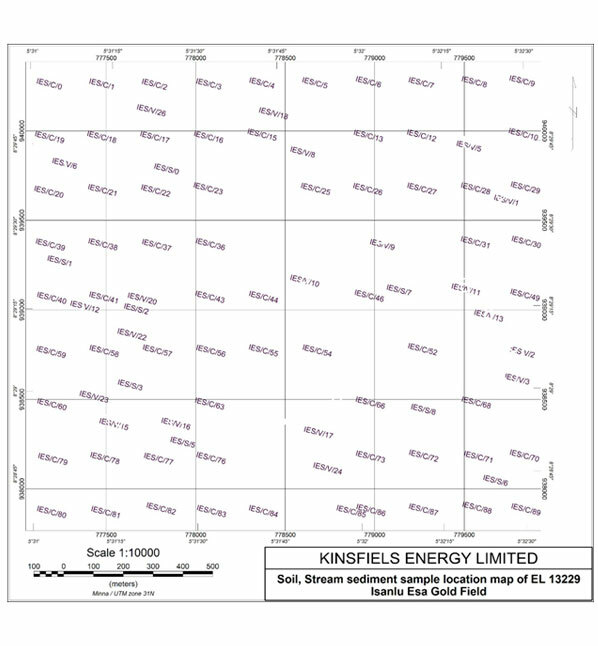 The license covers an area of 7.2sqkm of Gold field, intensive exploration work on this field commenced in 2012 and has reached advanced stage. 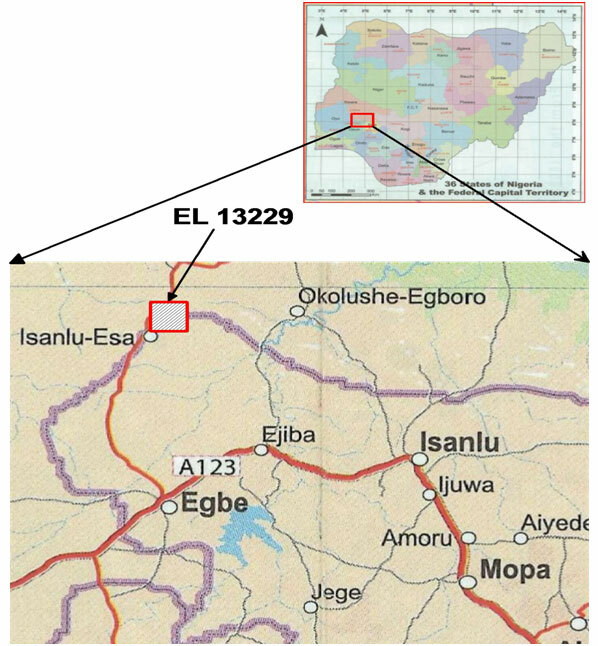 Regional geological setting belong to that of Precambrian rocks of Nigeria grouped into three principal subdivisions; Migmatite – Gneiss complex,The schist belts and the plutonic series plus affiliated minor rocks which bear imprints of Liberian (~2700Ma), Eburnean (~2000Ma),and Pan African (~650Ma) tectonic events. The field falls within Ilesha- Egbegold field belonging to the Schist belts group, one of the four major gold fields in Nigeria. Litological units within EL13229 include Schistose rocks, Quartzites, Pegmatites, Floating Banded Ironstone and ferruginised laterite. These greenstone facies are widely recognized as the host rocks for primary gold mineralization within the field. However, 80% of artisanal gold production has been from alluvial deposits derived from primary gold mineralization in the greenstone belt. Most primary gold mineralization in the schist belt commonly occur in disseminated form within quartz veins. Typically,gold bearing quartz veins carry some sulphides,galena and pyrite being the most common.The veins are very often conformable with the general N-S to NNE-SSW structural grain of the basement and occur in a variety of geologic settings which suggests that there was more than one period of mineralization. Mica-rich Pegmatites are predominant in the western portion of the area,they are low-lying and sometimes they occur as isolated ridges of about 10m higher than the surrounding topography. These pegmatites are mainly Mica (muscovite) rich with over 50% muscovite, 25% Quartz and less than 20% feldspar from field observation. The pegmatites are strongly associated with Base metal Mineralization, such as Tantalite, Cassiteriteetc. The eastern half of the area is covered mainly by quartzite mostly trending NNE-SSW. It composed of over 90% quartzite with appreciable amount of feldspar. 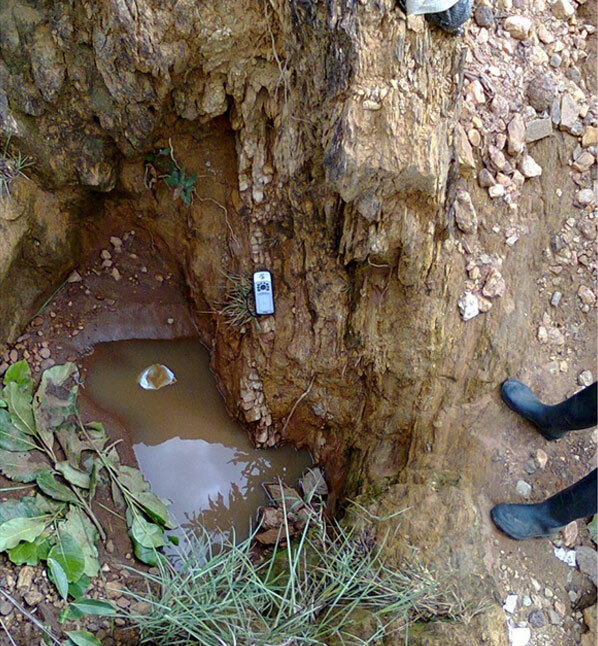 Mineralized veins of few cm to 1m are observed in some artisanal mining pits. Common minerals observable under hand magnifying glass include gold, tantalite Cassiteriteetc. determiningthetrendofmineralization,attitudeandgeneraltrendsofthetargets,as wellas estimate the depth of emplacement of thedeposits. The total of 52 traverse line of 50meters separation were established, VLF reading were taken at 10meters interval along the traverse lines. 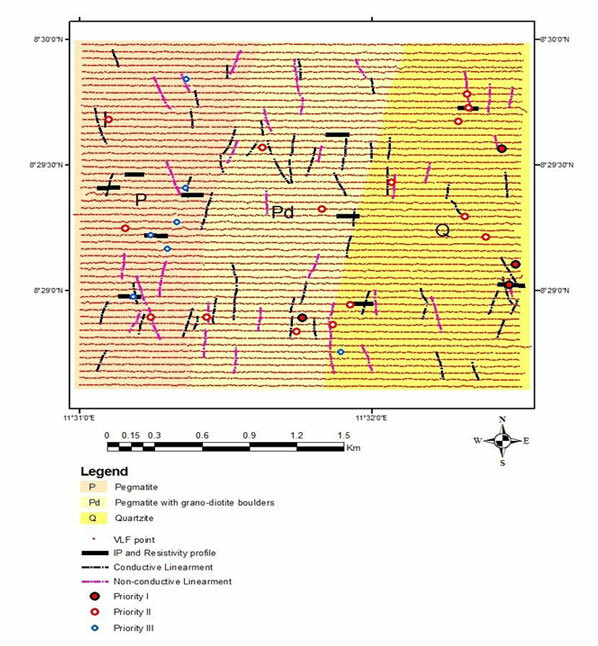 Several areas of interest were delineated and followed up with Magnetic and Induced Polarization (IP) imaging resulting to points of interests for core drilling, classified into Priority I, II and III according to their order of priority. Thus, arrangement for core drilling on the priority targets have reached advanced stage. 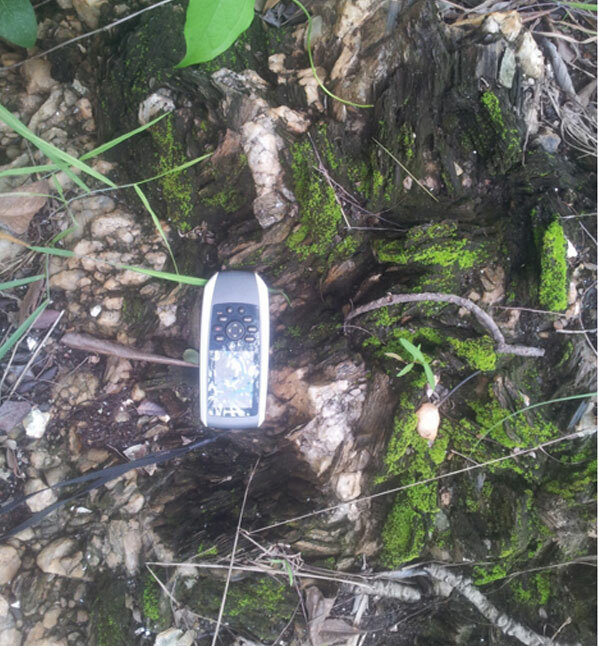 The total of 96samples were collected atapproximately 300m X 300m grid, covering soil, Rock, Pitting, Trenching, stream sediment from few river channels within the field. Multi element and Fire assay analysis were carried out on the samples at ALS Laboratories Vancouver and Ghana respectively. 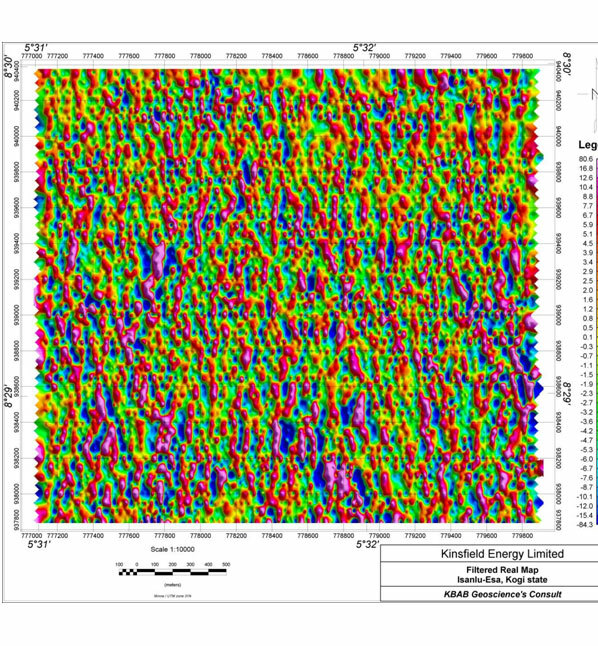 Data interpretation and analysis reveal strong correlation between Geophysical and Geochemical results.